Hubert was born in Greifendorf, Czechoslovakia. He joined the Mariannhill Missioners in 1928. 11 years of study resulted in his ordination as a priest in 1939, just as WWII broke out. As a new priest, he found trouble by saying mass for French prisoners of war, though this was strictly forbidden. A move to Glockelberg found him in trouble with the Hitler Youth, who were bothered by his actions and words. 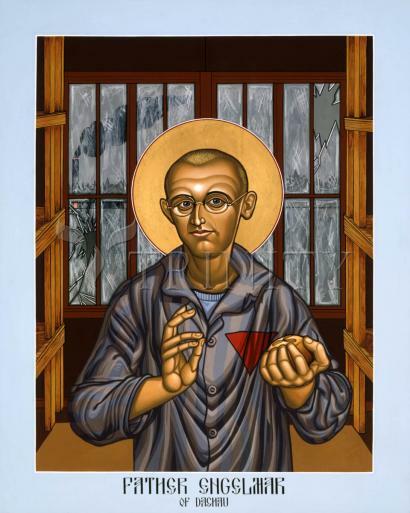 Their reports led to his imprisonment at age 30, in Dachau . He arrived 6/3/41 and became #26147. Upwards of 3,000 clergy were gathered in priest barracks and forced to wear a red triangle on their clothes. Barracks #26 was his residence. Threats, terror, abuse, fear, and death were his companions, day after day, for almost 4 years. 12 hour workdays on little food were required. He would say mass, translate bible texts, bring bread and the Eucharist to his fellow prisoners. His letters show he never succumbed to hate, forever trusting God’s will in his life. During December, 1944, a typhus epidemic broke out. The sick were gathered in specific barracks, and left to die alone. 20 clergy from the two priest barracks volunteered for what in reality was a death sentence. Fr. Engelmar was one, offering Gods example of love for his neighbor. In that last month of his life he still wrote: “Love doubles one’s strength,” “it really ‘has not entered into the heart of any man what God has prepared for those that love him’,” and “the Good is undying.” He died at 7:20am, March 2, 1945. His good lives on. Hubert Unzeitig was born on March 1, 1911 and had at least one sister. At the age of 18 he commenced his studies for the priesthood and also entered his novitiate with the Mariannhill Missionaries in Reimlingen; this was in contrast to his earlier intention to become part of the missions. He spent his time as a student of both theological and philosophical studies in Wurzburg. In May 1938 he made his final profession of vows into the order and was received into it with the name of "Engelmar". He was later ordained to the priesthood on August 6, 1939 just a month before the outbreak of World War II and celebrated his first Mass on 15 August 1939 on the Feast of the Assumption; he was soon after assigned as a parish priest in 1940 in Glökelberg in Austria. The Gestapo arrested Unzeitig on April 21, 1941 for defending Jews in his sermons and sent him to the Dachau concentration camp without a trial on 8 June 1941. While there he studied the Russian language in order to tend to the Eastern European prisoners and administered to all prisoners in general in his role as a pastor. In the autumn of 1944 he volunteered to help in catering to victims of typhoid but he soon contracted the disease himself. From prison he wrote to his sister: "Whatever we do, whatever we want, is surely simply the grace that carries us and guides us. God's almighty grace helps us overcome obstacles ... love doubles our strength, makes us inventive, makes us feel content and inwardly free. If people would only realize what God has in store for those who love Him!" Unzeitig died of the disease on March 2, 1945 and was cremated. His ashes were smuggled in secret to Wurzburg and was hailed as the "Angel of Dachau." The process of beatification was held in Wurzburg and was conducted in a usual form since it was conducted in two forms: the case in which miracles would be required and another in which a recognition of "in odium fidei" would be required. The "nihil obstat" (nothing against) for the cause was granted on September 5, 1988 which allowed for the Congregation for the Causes of Saints to confer upon Unzeitig the title Servant of God. The process for heroic virtue was conducted from July 26, 1991 until June 1996; the process was declared valid on January 11, 2002. The Positio on his life and virtue was submitted to Rome for further investigation in 2005 and allowed for Pope Benedict XVI to proclaim him to be Venerable on July 3, 2009. The next step would have meant the recognition of a miracle for beatification and indeed a process for one such healing was initiated and validated on June 2, 2007; a medical board based in Rome even approved it on March 25, 2010. However a simultaneous process was conducted from July 26, 1991 to May 25, 2012 to investigate if Unzeitig qualified for a decree of martyrdom and the process was validated on December 14, 2012 with another Positio submitted to the Congregation for the Causes of Saints for additional investigation. Pope Francis approved those findings on January 21, 2016 declaring him to have been a martyr which would allow for his beatification, which shall be held in Germany on September 24, 2016. Love doubles our strength, makes us inventive, makes us feel content and inwardly free. If people would only realize what God has in store for those who love him!